Of all the goods and services offered by franchises--giant pretzels, pest control, elliptical trainers--the most important is probably the one that goes least noticed: healthcare. In fact, many patients have visited a healthcare franchise without even realizing it. With the rising cost of healthcare and the millions of people expected to seek treatment under the Affordable Care Act, physicians, hospital systems and enterprising businesspeople have been searching for faster, more efficient and more affordable ways to deliver quality service. What they've found is that the franchise model can dispense routine medical care as efficiently as it delivers other products and services. Mark Kirsch, a principal at the Washington, D.C., office of law firm Gray Plant Mooty, has helped several healthcare franchises navigate regulatory hoops in recent years. He believes there are numerous reasons for the gold rush in the sector, which includes franchised urgent-care centers, dental clinics, chiropractors, hearing-aid clinics, testing labs, billing services, massage clinics and other specialized concepts. "There's a real demand for high-quality, moderate-cost healthcare," he explains. "Some people view things like teeth cleaning or regular checkups as a commodity, something routine that can be delivered with good quality at a good price, and more conveniently than the way they're provided now." Another factor: The aging population of Baby Boomers is adding stress to the healthcare system and will take up a greater percentage of medical resources over the next few decades. That means the ability to serve more patients with fewer overhead costs will become a critical challenge for medical practitioners. Tracy Weise--founder of Weise Communications, a Denver-based firm that provides marketing services to healthcare businesses, including franchises--agrees that learning to work with limited medical resources and a growing patient base is a major challenge. "If you look at the growing population and demographics, there aren't enough physicians, period, to cover people who need healthcare," she says. "There's simply not enough financial motivation for young doctors to become primary-care physicians. The amount of hours they have to work and the time they spend with insurance companies means they're not making money, and they're not doing the job they want to do." Weise adds that the implementation of the Affordable Care Act doesn't mean there will miraculously be enough doctors to look after everyone who's eligible for coverage. "That's why franchising as a healthcare model makes sense. It creates the systems and processes that take the headaches out of insurance and billing," she explains. "It creates better access and greater access in a lot of different places. It takes all the best practices and implements them in a system to create the best delivery at the lowest cost in the most places." It was the lack of efficiency in the current system that drove Miami-based hand surgeon Alejandro Badia to develop OrthoNow, an urgent-care franchise that specializes in injuries like jammed fingers, sprained ankles and dislocated shoulders. The company expects to open as many as 30 centers across the U.S. this year. "OrthoNow was born out of a sense of frustration," Badia says. "As a hand surgeon, virtually everyone who came to see me had been someplace else before or had waited for hours in the ER and gotten an erroneous diagnosis. By the time they saw me three weeks later, their problems were worse and harder to treat. I sensed the way healthcare was run was a waste of time and money." Once a franchisee of a now-defunct urgent-care concept, Badia believed a similar franchised clinic could work if it focused on orthopedic care--a place where a patient with a knee injury wouldn't have to wait for hours while life-threatening cases were prioritized. OrthoNow, Badia says, is more cost-effective and offers better treatment than general treatment centers. "The truth is, you don't need a board-certified surgeon to see you if you have shoulder pain," he explains. "An orthopedic physician's assistant can do that job very well. And if a patient needs something like their knee or spine looked at, OrthoNow can funnel them to a sub-specialist." The benefits for patients extend to their wallets, too, Badia contends. "If someone without insurance comes into an OrthoNow to see a provider and have an X-ray, it will probably cost $300--a bit more if they need an MRI or a cast," he says. "The hospital-affiliated urgent care down the street is four times that just for the assessment. The patient will have to finance $1,200 or put it on their credit card. Then [the clinic] will likely just refer the patient to the hospital." John Leonesio, founder of Massage Envy Spa, left that successful system in 2008 and two years later went on to helm The Joint…the chiropractic place. He has helped grow The Joint to 140 units and hopes to open 120 more by the end of the year. The concept relies on economies of scale and a membership model to make chiropractic treatment affordable and convenient. By cutting out insurance companies, Leonesio says, The Joint reduces paperwork for employees and patients; additionally, the units stay open at night and on weekends, offering convenience for patients with busy workday schedules. "We don't take appointments; we're walk-in only," Leonesio says. "When we asked customers what they wanted, they said they want a very good doctor and treatment that was convenient and affordable. If they hurt their back on Friday, they didn't want to wait until Monday morning to make an appointment." The reason chiropractic treatment works well as a franchise, Leonesio argues, is that much of it is routine. Members of The Joint get four appointments for $49--about half the typical insurance deductible for chiropractic care, he says. Instead of seeking treatment only when they're in pain, patients under the membership model are incentivized to come in regularly to prevent problems and higher costs down the line. And for the 60,000 U.S. registered chiropractors, many of whom struggle to keep their practices open, The Joint can make financial sense. "We can provide services more efficiently and cheaper than a traditional practice can," Leonesio says. "With our organization and technology, chiropractors can be a lot more efficient and still make a good living, which in turn makes a good franchise model." Most medical franchisees are businesspeople who hire physicians and other medical staff to provide services. For the medical workers, there appears to be no stigma in being associated with a franchise. In fact, as doctors begin to understand the advantages of franchising--most significant, the reduction in paperwork and managerial duties--they are seeking jobs at franchise concepts. 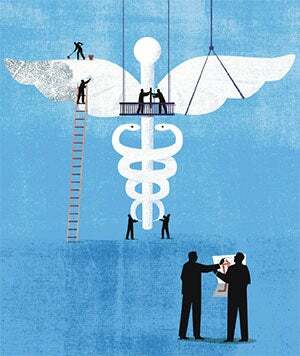 "The big point of differentiation between the model we operate and working elsewhere is that a healthcare professional can focus on what they love about their craft: treating people and providing healthcare for them," says Scott Hoots, vice president of franchise operations at AFC/Doctors Express, an urgent-care franchise with locations in 27 states that was acquired last year by American Family Care. "They don't have to do payroll or fill out tax forms. They don't have to hire and fire people. Their sole focus is on patients, and that is what attracts high-quality doctors to the system." There are other advantages, too. "Our compensation is competitive with other medical centers, and with a much better lifestyle. There are no beepers or being called in during the middle of the night," Hoots says. "Someone asked me the other day if we get good physicians. We're not getting flunkies or physicians hired right out of medical school. We have doctors at all career stages because of the benefits we offer." Patients are also seeing the efficiency of franchising. While at a hospital ER the average wait is four hours, AFC/Doctors Express claims it can move most patients in and out in less than an hour. But being able to offer that kind of quick service means medical franchises need to ramp up quickly before the Affordable Care Act dumps millions of new patients onto the market. "Forty percent of patients in the ER shouldn't be there," explains Russell Smith, director of franchise development for AFC/Doctors Express, who says the system will add 20 new locations in 2014. "They should be in urgent care, and they will soon move there. That's why we're rushing to open more franchises and corporate locations. The market itself has grown, and the Affordable Care Act is going to increase the number of patients we see on a daily basis." As healthcare providers of all kinds struggle to keep up with patient loads, many more franchise concepts will emerge, The Joint's Leonesio predicts. "Healthcare franchising started with eyeglasses a while ago, and more sectors have caught on. People are finding better, cheaper and more efficient ways to deliver healthcare services than other practices can, whether it's teeth cleaning, urgent care or back adjustments," he says. "There are still opportunities waiting to be found in every medical field."